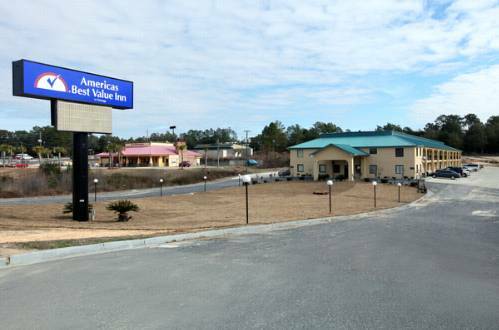 Welcome to Americas Best Value Inn of Crestview/ Florida/ located off of I-10 Exit 56. Our hotel is near Blackwater State Park/ Fort Walton Beach/ and Northwest Florida State College. We are a short drive from the areas beautiful beaches. Play a round of golf with friends at Foxwood Country Club of Crestview. Samuel*s Roudhouse/ Whataburger/ and Cracker Barrel Old Country Store are all within half a mile from our hotel. Americas Best Value Inn Crestview offers unbeatable service/ an attentive 24-hour front desk staff/ and competitive rates. Stay connected with free wireless high-speed Internet access available throughout our hotel and guest rooms. Appreciate the convenience of our on-site guest laundry facility. Step into our guest rooms and experience absolute relaxation with deluxe bedding/ microwave/ mini-fridge/ cable TV with HBO/ hairdryer/ and free local calls. Irons and ironing boards are available upon request. Pets are allowed/ charges and restrictions apply. At Americas Best Value Inn Crestview/ Weve Got You Covered from the time you hit the road until your head hits the pillow. Americas Best Value Inn Crestview is located off of I-10 Exit 56. Our address is 4255 South Ferdon Boulevard/ Crestview/ FL 32536. In the 1930s it made sense to buy ice from a building that looked frozen. Too bad the old ways have been forgotten. Named "Wall South," this half-size replica of the Vietnam Memorial Wall in Washington, DC, was dedicated in 1992. Unlike the original Wall, this one has a helicopter propped on top. A life-sized flight deck replica of aircraft carrier USS Cabot dominates one huge gallery, with vintage World War II fighter planes arrayed on the deck. The infamous "Mission Accomplished" jet of George W. Bush is here, too. 37 acres of outdoor exhibits as well. The ultimate Old School miniature golf attraction with a giant Tiki head, Sphinx, and dinosaurs. Built in 1959.